Since music subscriptions services like Spotify and Pandora (s p) are all the rage, I had a brilliant idea: listen to them in my car instead of the same boring CDs. However, auxiliary cables feel a little dated, and I like to avoid them. Instead, I checked out some Bluetooth A2DP streaming solutions for wireless in-car streaming. Note that Bluetooth hands-free and Bluetooth AD2P audio streaming are different. When I recently bought my new car, I was excited to be able to answer the phone via built-in Bluetooth, but was disappointed that Bluetooth AD2P wasn’t supported by my new Prius. Many cars come with Bluetooth hands-free, but not AD2P. The devices I tested have some combination of charging, hands-free phone calling, and streaming AD2P audio from an iPhone (s aapl) to a car stereo either via FM transmission or the auxiliary (aux) input that newer cars do include as standard or part of a basic entertainment package. If you want it all, then the Soundfly BT Ultimate $59.99 is the way to go. 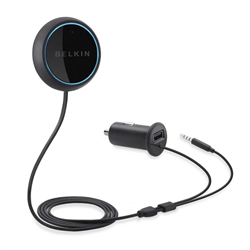 It not only charges your iPhone via a USB port, but also allows you to stream your audio to your car stereo either using an aux port or FM transmitter. The adapter has a full set of controls for audio and hands-free phone function, and also offers use of those functions via remote control. The remote is important, since many cigarette lighter adapters (CLA) are tucked out of reach. An adjustable microphone makes it easy to find the optimal place for callers to hear you, and it even has an SD card reader so that you can use it for music without an iPhone. Although this device had the most features and flexibility, and an attractive price, sound quality was less than optimal for phone calls. Callers often asked me to repeat myself. Music quality was good, though as with many similar devices, there was a hum due to the fact it provided both power and audio. The controls on the adapter were complete inaccessible in my Prius and Camry, (s tm) and for long-term use, I would mount the remote with Velcro in my car. If you don’t need FM transmitter support, but want everything else, the Belkin AirCast $79.99 is a good choice. The CLA has a USB port as well as a wired remote and aux combo cord. While the length of these cords is adequate for most cars, the AUX cord isn’t removable and could pose a problem if it proves too short. The remote is a simple round magnetic disk that will stick to any metal surface. Similar to your iPhone’s home button, the button on this device is multifunction depending on the situation. It can flash to tell you a call is coming in, as well as be used to pause music and pick up a call. Sound quality was excellent with the AirCast, though again a slight hum could be heard because the device was providing both power and audio. Callers could tell I was on Bluetooth hands-free, but could still hear me just fine. If you already have a charger or want to avoid the typical hum the power+audio devices have, the Griffin BlueTrip Aux $79.99 is the way to go. Although the microphone is built into the device and not adjustable, the BlueTrip’s hands-free was the easiest for callers to understand. This adapter eschews a remote and simply has a button that can be used to pick up calls. While I appreciate the minimalist approach, for most users, the CLA will be in a difficult position to get to. The audio quality was the best of the bunch, which makes sense since it didn’t have to worry about providing power. If you do need charging, Griffin makes a companion device, the PowerJolt Plus for $29.99, that provides pass-through capabilities so you can use it to charge your iPhone along with any other CLA device such as the BlueTrip or non-Griffin devices such as a GPS adapter. Because it provides power separately from the BlueTrip, the audio quality didn’t suffer when I used both the PowerJolt Plus and the BlueTrip. If, like me, you’ve already got a built-in hands-free solution and just want to stream audio and charge your iPhone, then the Tunelink Auto $99.99 is for you. This device also works with an iPod touch and iPad. Although it’s the most expensive product I reviewed, and had the least amount of functions, what it does do, it does well. The Tunelink includes an aux cable and iPhone adapter to charge your device while streaming audio. Unlike the other combo devices, their proprietary “humbuster” technology minimized the interference coming from the built-in charger. In my quiet Prius, I could occasionally hear a tiny bit of distortion, but mostly there was none. For cars without an aux port, the Tunelink supports FM transmission to play music. The Tunelink also has a companion iOS app that makes finding the exact FM stereo frequency a snap. It uses the GPS coordinates to find what the best station for your area is. The app also allows you to immediately begin playing audio when you get in the car, and even lets you share your Bluetooth connection with others, so if your travelling companion wants to play her music, she can not only play it from her iOS device, but control it as well. 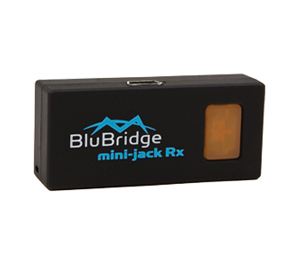 The Miccus BluBridge mini-jack RX is a battery-powered little wonder that only provides AD2P audio, which means no distortion from a connected power source. It’s also extremely flexible and can stream your iPhone audio to any device that has a mini jack input (multiple adapters were included). This allows you to stream your iPhone audio to your home stereo system without having to worry about docking stations. Long term use of this device (more than eight hours) in a car will require power, so I tested it along with the Miccus Chargeblock Car Adapter 2a (which supports both the iPad and iPhone). Similiar to the Griffin device, I had no problems with hum while charging. The Chargeblock was the smallest charger I tested, and with the combination of both the Chargeblock and BluBridge, the combo was still smaller than any other devices reviewed here, making them perfect for those wanting to maximize storage space. The two minor complaints I had about this device was that to save power, it would go to sleep when it wasn’t paired. All the other devices I tested auto-paired with my iPhone once I turned on my car. The BluBridge needed to be woken up. Presumably because it was battery-powered, the audio output was also somewhat weak coming from the device, and required me to turn up the volume much higher than I did with all the other devices. Because my Prius had built-in hands-free already, I opted for the Tunelink. The excellent audio quality, features and iOS app won me over. For my spouse’s Camry, we decided on the Griffin BlueTrip aux. The audio quality for both phone calls and streaming was the deciding factor. For those times we need charging in the car, the PowerJolt plus was an excellent companion (though the Chargeblock Car Adapter also proved handy for charging the widest variety of devices). Disclosure: All vendors provide samples for this review. Just got a new car with BT-Audio support… too bad the iPhone sends audio at max volume. If I have my stereo volume at a normal volume while listening to satellite/radio/cd, then start playing my iphone, it is extremely loud. Oh man, I can’t tell you how long I’ve been pining for a device like the Tunelink that ONLY does A2DP. I’m using an Android phone, which is extremely annoying when you connect two different devices that both support the hands-free profile. EACH time you connect them, you have to muck around in the bluetooth settings in order to get calls going to one device, and music to the other. Can’t wait to try out the Tunelink (for android). It sounds like my prayers have finally been answered. Thanks for the heads up! I also have a Prius without a2dp (Simon, pre-2010 Prius don’t have this option). Can you go through steps you took to have your device stream audio to one bt device and phone to another? Thanks for a great article btw. My Ford Fusion (with Sync) has A2DP built in.